My last bird got kicked out of the nest and flew successfully, I think. Actually he jumped out completely on his own. He's been watching his older two brothers soar and he's had enough of this waiting around with mama. I took A to Kindergarten Round Up. I tried to prep him as much as possible. He does not like new experiences and learns by watching versus doing. However, he is the youngest and he's been watching his brothers for the last five years of his life. I actually think the youngest is going to be the easiest for me. I probably will be emotional on the first day of school, but more because I know I should and not because I truly am. I'm been processing the "last time" with A his entire life. It is his role, and it has worked for us. I've been asked lately if I still write about my boys. I respond, "Not so much." Readers wonder. And finally I have a good answer. Because it is less about me and my growing as a person. They are at an age when the stories are theirs and they should have the right to choose to tell them or not. I'm passing off their childhood to them and their memories and what they wish to recall and recount someday. My childhood memories are mine and not an entire internet world. I get to dictate what gets recounted and remembered, and so this is my gift to them. I'm giving them their childhood. They get to be their own writers. I've been brainstorming possible new blogs. Trying to see where the energy might be at. I'm feeling the release to return to teaching secondary. I've kept that love in a box for the past nine years and just recently I've started to dream and plan and that is exciting to me. I've opened up that career box again and I'm ready. My mornings of cold coffee are behind me. No more diaper. No more doldrums. Everyone tells you it goes fast and it does and it doesn't. This was almost a decade of early childhood, that's a long time. And like my husband said, "Its only good because it didn't last forever." I agree. Thank you for reading. Thank you for commenting. Hopefully you were entertained and encouraged. Hopefully I was authentic. If you've just found me, start at the beginning and relive the journey right where you are at. Becoming a mom was a transformation. My world was turned about, for the better. I really did die to myself and sacrifice a ton. I am realizing more and more what I gave up as I leave this stage behind. I did gain a lot too, and I'll realize that more and more as time passes. I'm a better person. I'm opening myself up to the next stage knowing that my response will continue to be the biggest deciding factor in my joy. There was a new display at my local library: William Stafford, pacifist. I was intrigued. Would I actually find the time to read his works, I took a chance and checked out a couple of books. For a week they sat, collecting dust. I expressed wanting something rich and contemplative to read to my husband. His response, "You'll find something." The next afternoon I made myself a cup of tea, pulled the chair close to the fire, and opened, Ask Me, 100 essential poems by William Stafford. It was perfect. I love the layers that poetry allows. As I was reading I was reflecting on the Bible and how much of the Bible is written in poetry. There was a similarity in the works of Stafford: a seeing, reflecting, yearning, and searching...the same that I find when I read the Psalms. This is what I needed. Over the course of the week I gave myself rest and read this man's thoughts. I even shared a couple with my 9-year-old son and he smiled as he read. We read together, "With Kit, Ag 7, at the Beach." I also loved "Passing Remark"
In life I don't like much to happen. says, "Then why did you choose me?" I'm always gravitating toward memoirs, biographies, and fictions, but why not a book of poetry from time to time. Its a different type of indulgence. It has been a progression. It has taken the last three years, or so. I opened myself up to the possibility that I perhaps had put God in numerous boxes that made me feel safe and secure, but were in fact not really accurate or true....or they are true, but I need to own them more versus just accepting them because that is what others have told me. I have allowed God to change me through relationships, creation, circumstances, conversations, listening....and I'm still on this trajectory. Faith is not a straight ladder to some place of ultimate arrival, but rather a cyclical turning and renewal process. Sometimes this can be very frustrating and lonely. I'm attempting to find contentment in the gray spaces and not rush the process so I feel safe. Sometimes I miss the black and white. The thing is, I'm more and more overwhelmed by the reality and greatness of God and less and less enamored with church as a place of knowing God. Now before you throw me into a category of disbelief, hear me out. Church still plays an importance in our family life. But, my husband and I feel more like observers than participants, and I think it is because God is very confined in church and not very real, at least in the ways I'm learning to hear and worship him. My dialogue with God is looking more like poetry and less like prose, and when that happens one needs space, and church isn't about space. Church is about going, being seen, interacting, being on board with a certain goal or purpose that is being pushed by the church leadership at the time. Which is fine, but I find myself in conflict often with that goal or purpose. What if my calling is different than what is being stated from the pulpit? Do I then have to throw out my calling and get on board with the group? Or, do I recognize that there is much good for me to hear and listen to, but that the word of Christ might look different in my life and in my circumstances. Church is less about the hour of song and word, but more about the dialogue on the drive home, the dialogue through the week. the wrestle, the disagree, the agree, and the revelation. I'm soaking in the enormity of God, which means I'm stopping in the silence and being overwhelmed by the awesomeness of the small. One day I headed out to the shop to put away the boys' bikes and close up the garage door, which faces west. I stopped. I stopped my path and I looked. The sunset overwhelmed me, and I decided to honor God and recognize the truth of him in that moment. I breathed, and I felt my belief in God was real. The love of God was great. The truth of God was there. When I'm helping my youngest master bike riding, I stop and notice the dried earth and dirt, the yellow weeds pushing themselves through the cracks in the ground: the beauty, the systems, and laws of nature that work life into order. This also brings forth my gratefulness and humbles me into something very small. The thing is, I have peace now, and I love the earth that God created. I crave more of it, and I don't want it to come to an end any time soon. I start second-guessing my faith when I read other Christians say statements like the above. I start wondering what is wrong with me that I don't desire more time in church, that I'd rather go to the beach on a Sunday, that I regret going to church on Easter and think we should go for an Easter hike next year, and that the chaos that is Sunday morning does nothing for my soul. I start getting scared. I start to panic and I start to reconstruct my God-boxes and hug them to my chest like a baby's blanket. Then I remember those in my past who loved God fiercely, but also loved life and wanted a life as long as possible. The person I remember is my grandfather. He lived to be 97 and he wanted more. He didn't give up on living until minutes before his death. He was in a bit restless and fighting in the hour leading up to his end. Family members finally put on sacred music and this seemed to calm him into acceptance. He loved nature. He loved Oregon. I realize now that this introvert found God in these mountain places. I can still remember my grandma describing a tree and the beauty in its height. They taught each other how to know God. In his early 90's he was ordering remedies that would lengthen his life. He was NOT quitting, and I think we are, none of us, supposed to quit. Life is this crazy, unfathomable, gift and the way I respect it is by living it and soaking in all its corners. The living of my life is integrated into the understanding and the not understanding God. The not understanding God is just as important as the comprehending, because admitting you don't understand God is admitting you are completely human and completely small and completely only saved by Grace. In all this I whisper the name of Jesus. Facebook, Five More Days, Woops! I thought'd I'd give you all an update on my FB fast. 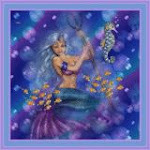 First, it has been very freeing and cleansing. Its always good to break a dependency, at least it is for me. And having FB constantly send me emails letting me know how many messages I've missed or updates or photos I've been tagged in has strengthened my resolve to not bend to their will. I am pleased to announce that I no longer take photos with the idea of posting them and hearing what others think. I now take photos to document moments for my children and myself. I've almost stopped thinking in status updates, almost. I've reached out more, called more, had more real conversations. I initiated two spontaneous invites with friends to go out to eat, something we've always referenced when we see them, "Oh, we should really get together." But no one ever follows through on these threats. Well, I finally did. I think it was my desire for fellowship, which FB has a deceptive way of fooling you into thinking you are getting through efficiency and the comfort of your handheld device. And, the biggest lie that kept me FB addicted was that I might miss out on something really important. Well, two important happenings occurred this last month (my friend's son broke his arm and another friend had a medical emergency) and I found out about both of them quickly and timely via a real person letting me know. Take that FB! However, I will return. I will return in moderation. I will not put it back on my phone, at least not for a long time...maybe just on a trip. (Yep, I'm doomed, go ahead and say it.) I like to keep it quarantined and not so entangled in my breathing. But, there have been inconveniences. I wanted to organized a gift basket for a friend and gave up knowing that most of my contact info was via FB. I also wanted to let a few friends know about a soccer opportunity, and it would be so much easier if I just logged on and sent them a group message. Then there are those friends who live far away and without Facebook we have little to no contact. I don't want to let these friendships die. Some would say, "Let them." But that's not like me. And I must confess, seconds ago I accidentally logged in and saw that someone requested to be my friend. I was horrified thinking that they've been waiting for my reply and might feel my silence was a direct form of rejection when it was not. I quickly confirmed and logged off, especially when I saw that my friend Eric was online and would rip me to shreds if he saw me on FB during my fast. Eric, did you notice? Yes, it was an accident. See the body remembers. I was meaning to log on to my blog, but my fingers took over and typed in the other search and password...see I was thinking in my head, "Write Facebook update," and I pretty much did. So, in five short days I will enter back into that world of surface connections that bug and annoy and humor me and keep me connected. Plus, then I can get my blog following back up when I cut and past this link in my status update, and lots of affirmation when I post a pic of my cute kids or one of their witty statements that pretty much makes me look good. "Any psychiatrist can tell you that genuine healing requires a candid confrontation with our past. In any case, if there is to be reconciliation, first there must be truth." Blood Done Sign My Name: a book that is changing me, showing me newly discovered truth, and is challenging me to reevaluate past perceptions. 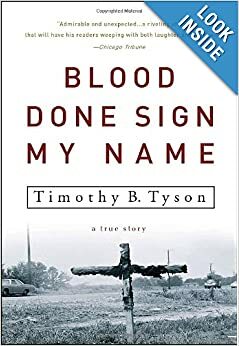 This book works because Timothy B Tyson is brave enough to be honest. Timothy brings a perspective I greatly needed to hear, a white boy living in the south, dealing with his own issues of racism even though his family considered themselves, "white liberals." Right away I could relate. Not because I lived through the 60's and 70's and grew up in the south, but because I grew up thinking that my family was not tainted by our country's history of racism. We are all tainted and effected, to deny this is to deny truth. Truth does set you free...moves you forward. The people in our country and the world deserve the Truth. Tyson is a writer and historian and does a good job documenting that at this time in our country's history the majority of whites were uncomfortable with the idea of desegregation. Probably people of my generation like to think that our families were different, in the minority, but if we were able to go one or two generations back and interview our grandparents and great grandparents honestly we would hear a different refrain. The story starts with Marrow's murder and Timothy pondering the fact that one of his white friends is from the accused family, but then he goes back and tells an honest story weaving his own family's transformations and roles in the race revolution that began to burst forth under the leadership of MLK, and the forces and factors that were at play in our country after WWII and beyond. People are changed through relationship. Each relationship is important as we grow and change as a united people. Leaders are important. They inspire, but Timothy's life and his family were just as essential. So were all the players big and small in Timothy's story. I'm only half way through this read, but I felt compelled to write this now with this being the day we remember Martin Luther King Jr. and all the known and unknown heroes of that movement. Truthfully, I have done little to honor the man and the Civil Rights movement on this day in the past. 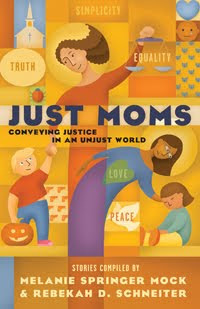 It is just another Monday holiday to sleep in and enjoy my boys, so I am thankful and humbled to be in the midst of this read over this weekend and to be in the midst of my own new revelations regarding race in our country and in my family and families like mine. "But the hierarchy of white supremacy at its heart, was as rotten as that pile of old shoes, and the generations that follow will be many years cleaning it up." (When a country tolerates and celebrates racism like ours did, why are we baffled when we still have to deal with the repercussions of that sin. This also brings great irritation within me toward a common line that many conservative Christians constantly echo, "If only we could get back to the moral foundation that our country started with. Our country continues to slide more and more toward moral decay." This statement angers me because it has total disregard for the sins and immorality that were showed to so many in this country for hundreds of years. It is a self-centered and uneducated statement, and it has its roots in the notion of white supremacy: white, male, land-owning supremacy. That is not the message of Christ, nor was this an era that somehow God blessed. We were not a City on a Hill and I think our youth deserve a balanced story. I appreciated how our author pointed out that history has almost turned MLK into this nice Santa Claus character when he was actually quite radical and very much not appreciated by the whole of white America at that time, "The real Martin Luther King Jr. went to Memphis in 1968 calling for the "the dispossessed of our nation" to "organize a revolution." There he told the nation that "the whole structure of American life must be changed"-just before somebody killed him." Timothy admits, "My particular world instructed me that nice white people must try to help blacks become more like white people. The astonishing arrogance and ignorance of these assumptions would be funny if those attitudes were not still fairly prevalent." A good book is one that challenges me and changes me. A good book is a book that I refer to and bring up in conversation with others. My soul and mind crave books like, Blood Done Sign My Name, and I am grateful for having a friend who handed it to me. My book group is reading this, and I am eager for our discussion. I am also eager to finish this work. I can think of nothing I'd rather do today than curl up next to my fire, drink a perfect cup of coffee, and read the words that are teaching me so much. The title pretty much sums up my blog post, and perhaps it is all I need to write, but I'll expand a bit. Over the last year or so I've become frustrated with my relationship with Facebook. I hate how my fear of missing out is really the only thing that keeps me posting and reading. I also hate how I start thinking only in status updates, or only take pictures of my kids with the soul purpose of posting them on Facebook. I don't take pictures anymore with the idea of preserving family memories and placing these pictures in an album for my children to look upon after they've aged and grown, but rather to see all the "likes" and comments. And it only got worse after I got my iPhone and could access FB at all times. Instead of reading an interesting article that would cause me to think and grow while I waited at the doctor's office, I'd scroll through the last few updates. Instead of journaling before bed, like I did in my youth, I scrolled again, and then fell asleep. I would actually feel a sense of victory when I would have a gathering with friends and no one would take a picture to post it on FB. But then I'd feel a bit cheated that not one of my 500 friends would get to know how fun my life was and that I had been to the beach with my friends, goodness. Then there was the parts of me that I didn't like, that were coming out...the judging side of me. I would make judgements in my mind about people based on a random posts here and there. As if someone can be summed up by their daily status updates. I'm sure that if I were having a face-to-face conversation with this or that person we would be having an authentic interaction and would be truly hearing each others' points of view and I'd end the visit feeling like I had truly heard someone instead of throwing them in the pile of ridiculous thinkers. Then I sunk to a new low, I posted something of my son's that was merely a brag, that was it...my only motivation. I was proud and I wanted everyone to be impressed. I wanted to read the comments of, "Wow, he's talented! That's amazing." Why did I need to hear this? I needed to purge. Still, what if I missed something? This line of thinking always kept me stuck. Then a friend who I hadn't seen in a while came for a visit. I found myself struggling to have a conversation. See, all those starter questions we already knew the answers to, so how were we supposed to start and reconnect? I finally stated, "B's been playing basketball." "Yeah, I saw that on Facebook." Conversation killer. That was it! Over the next few days I shared my new conviction with a few friends, "I think I'm going to fast from Facebook." Each January our church promotes the idea of fasting during the first week of the New Year. I've never participated. I always feel a bit lame for not fasting from food, and I would literally fall over if I did not feed my body. So I always give myself permission to not ever participate in this church fasting extravaganza. Others have fasted from movies, Netflix, FB, chocolate, coffee....etc...anything that they feel consumes too much of their time or cravings. Should I fast from Facebook? Each time I shared my new conviction to quit the social network, I grew in my confidence that this was the right decision. Plus, each person I shared it with actually agreed with me and thought it might be a great idea for them too. One friend was so bold as to completely delete her account! The other thing that spurred me on was my friendship with Heidi. Heidi and I have been friends since college and our friendship has continued to grow and evolve. We don't live close, but when we do get together we never run out of things to discuss and share. And she's never been on FB. What!? You mean I might not miss out if I too was off that blasted thing? My true friendships might survive!? I must be craving a simpler time when people actually called each other. I have even sent a few old-fashioned emails in the last few days, and they were grand. I loved them. They were personal, like a letter. Today was my sister's birthday. There was the temptation to post on her wall a glorious message that all could read and testify to our love for each other. But I didn't. I called. We chatted. It was about us and no one else. It was good. Seriously, at least for the first two days of my Facebook Fast I have felt liberated and free, daring and edgy. I love it. Happy New Year! I think I just went through a pretty major transition without really taking the time to notice and wonder in it. And so, I'm paying for that now, just a bit. I'm reflecting and processing a full year-and-a-half later. There even might be a little bit of grieving involved. Don't worry, I'm still completely outnumbered. That will never change. You should have seen me in Winco last week. I was the irritated mother of three boys who thought the grocery cart was a jungle gym or a platform for the X Games. With teeth clinched I pushed the cart of food, "Really? I thought these dreaded grocery days were behind us!" But, things have change, dramatically. I've always known I would return to work after my brief "vacation" of the early-parenting-years. In fact, I think I'm a better person when I am working. The long days of naps and diapers and waiting anxiously for daddy's return didn't exactly feed my soul. I need an outlet, so I poured myself into my writing. I also poured myself into my friends and into relationships. I instigated and planned women's retreats for our church. I was always inviting groups over to our house: bbq's and wine parties. I found myself on countless committees. It was actually a bit out of control, but I was getting a lot of friend time through all of this. Then I said yes to going back to work, part-time: teaching preschool, located at my older sons' school. My youngest went to work with me. No need for childcare. The new creative outlet came a bit more abruptly than I had planned as I found myself finishing out the school year for the previous teacher, so I didn't have much time to process what this change would mean. I knew I needed to achieve a balance, and so I let go of all my former commitments, but what really happened was a disappearance of my former-friend-life. Yes, I was busy and meeting new people and families. (And I have to say I love all these new relationships my job has brought me into.) But I didn't fully notice the old friendships fading until after it happened. C said, "I haven't lived long enough to know yet what age I would pick." Me, "That is very true." Maybe when its all said and done I'll pick 70, or 65, or 99. I have a lot more transitions and life stages to go, but for now I am very happy with the one I'm in. I'm only a tad bit nostalgic for the days when making it to a friend's kitchen table to sip coffee and eat a muffin felt gloriously victorious: our kids screaming and fighting on the floor amongst the Sippy cups and plastic chew toys. Perhaps there is no way to actually be cognizant of transitions when you are in them. That could be the whole point of the word reflection, but I strive to be a person of noticings, and so I wish I'd noticed a bit more while I was in the whirlwind of changing from the early-years to the elementary years, that's all. I do know I did it, and I do know it is over. I think I'm almost done grieving some of the things I've lost from the former life, mainly relationships that have faded and evolved. What I seem to be left with are some really deep connections that I see lasting a lifetime (relationships that go beyond diapers and potty-training), and a career that is extremely fulfilling and life-giving to me. I also have three little men who are becoming more and more independent: which has always been my parenting goal. And I am getting more time again with the man I started this all with, my husband. One day there will be another huge transition and we will find ourselves back to where we started: just the two of us. I could get almost giddy about this, but I won't because right now I'm 36 and the mother of three active, crazy, loving, smart, interesting boys who leave me exhausted and fulfilled all at the same time. When I was 18, I was so unaware of the layers that life would bring. Now I'm getting a small glimpse of what living means, and I continue to love the gift of life. I am thankful. Top Ten Toys to Not Get!